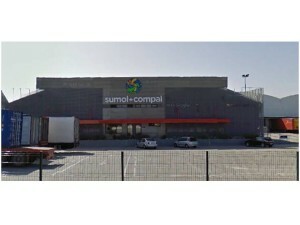 Sumol – Compal recently completed the rehabilitation of the waterproofing system of the coverage of its Almeirim unit. The system selected by the technical department of this company lies with the bituminous membrane APP modified bitumen – Polyxis R50 T Deck White – which was applied without removing the sealing system at the end of life. This way it was possible to perform the rehabilitation without any kind of interference in demanding industrial activity of this company’s agri-food area.